As we start our final week of our August repair series (having covered hair, skin & nails) it's time now for cosmetics! Having a flawless complexion is fantastic, but if you are like most of us, you need a little help to achieve that flawless look. That's where your best friend becomes your concealer! So let's start with a few tips on how to best apply and use concealers. If you use foundation, apply it first, and then apply your concealer. If you apply your foundation first, you'll find that you don't need to use as much concealer. 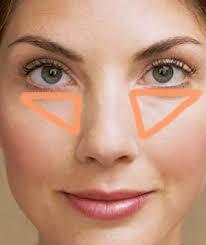 If you apply concealer first, however, you'll remove most of it while applying your foundation. The most flattering way to apply concealer is to draw a triangle with the base under your eye and the point toward your cheek. This shape not only conceals dark circles, but it also instantly creates the illusion that your face is lifted. Think of it as holding a flashlight against your cheek, shining the light right underneath your eye, and drawing the focus upward. To prevent your eye shadow from falling off your lid and settling in the creases, prime your eyelids first with a dab of concealer. If you can't justify spending extra on eye shadow primer, a dab of concealer works just as well. When concealing a pimple, first use a green concealer, then cover the area with a concealer that matches your skin tone perfectly. Cancel out a pimple's redness by applying green concealer with a clean brush to only the pimple (not the skin around it) to avoid spreading the bacteria. Then, use a cotton swab to dab on a high-coverage liquid concealer that matches your skin tone to camouflage the pimple. Blend it into the surrounding skin and finish with setting powder. Dab an orange- or peach-colored concealer over dark under-eye circles with your ring finger. Your ring finger, which is your weakest, will apply just the right amount of pressure to blend in the concealer without pulling at your delicate eye skin, and the orange or peach tones will cancel out the blue shadows that your under-eye circles give off. Top the orange or peach formula with a cover-up that matches your skin. Check out all our concealers - shop now while all cosmetics include FREE SHIPPING! This was super helpful AND interesting, thanks BCC! Thanks for all the tips! Very useful and interesting. I have always been afraid to use concealers because I had no idea which to use or how to use them. You have answered every question from colors to use for what to applying concealer after foundation. I'm getting older and need to use more than ever so I really appreciate this post!